Growing up, I always used to bake. It is something I remember doing with my Mom. As a little girl, I would sit barefoot on the cold counter top and study her every move as she heaped, dashed, mixed, and danced her way around the kitchen. I got to help too. "Gently," she said, as my small hands learned to crack an egg. Nostalgia aside, baking will always be happiness to me, for many reasons. I love being able to create a delicious something from scratch. I love trying new recipes, and dabbling in old ones that have been passed on from my Grandmother, and perfected by Mother. I love licking the dough off the spoon after all the ingredients have been combined, and the sweet smells that permeate through rooms as my creation is baking. I love biting into a warm, gooey dessert, and enjoying it with a tall glass of milk. But, I don't bake for just myself. I bake to share with others. To me, baking is love, love is happiness, and happiness is just a couple spoonfuls of sugar away! P.S. I found this recipe in my recipe box. I wrote it when I was a little. My Mom saved it after all these years. Gosh, it sounds like a really amazing cookie. After reading it too, I now understand why I never was a spelling bee queen. Lost to the word mildew. "M-I-L-D-......O?" Fail. I totally agree, I love baking. I also love this photo of you. Too cute! I love baking! It's so much fun! You look super adorable in your pic. 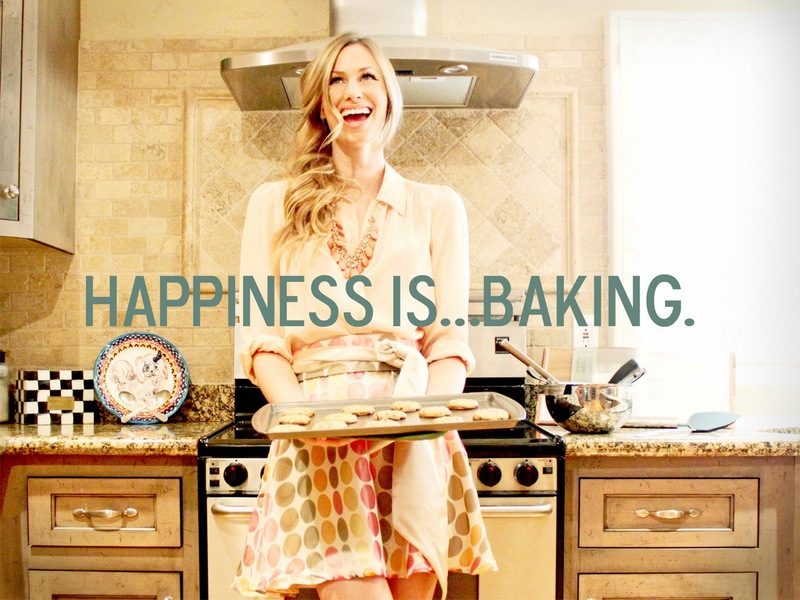 I agree, baking is happiness. Heck, for me, all food is happiness! I could not agree with you more! Baking reminds me of growing up, christmas with my mother, and now serves as a stress relief on a day that just wasn't what I wanted it to be. this picture is absolutely precious!!! and yes, baking is EVERYTHING! cute post! I also like to bake but for some reason barely make time for it... this post inspires me to! looks straight from a magazine. not saying you need to.. Terrific post. By the way, I checked out La Posh Style. I'm not the right size but the clothes are terrific and a good price. I hope others check it out too. No I am not an ad. Just pleasantly surprised. I wish I loved baking!! I think I'm going to try your mind set and bake to share goodies AND love with others! Coming from another spoon licker, this is my happiness as well. :) Especially around the holidays! You look like a model in this picture! Not only do I lick the spoon...I always lick the bowl clean too! I love this new series you are doing! Very inspiring. I want to something similar! Thank you all your posts!!! totally obsessed with this picture Katie. I'm found your blog on Pinterest and I'm so glad I did! It's so beautiful and postive! A big fat YAY for baking! You look totally adorable with those oven mitts on. I completely agree - the kitchen is my happy place, especially on the Holidays! I always like to give cakes/brownies/cookies/etc to other people, because it's like giving them a piece of me! i love that you have that hand written recipe from when you were little too cute! You look pretty! 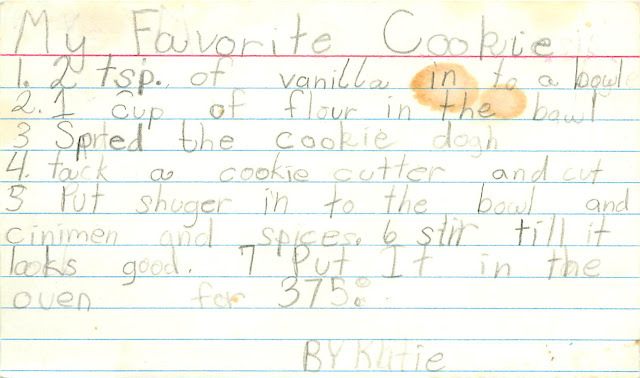 That recipe that you wrote looks adorable too! Oh my gosh, that recipe card is adorable. And the picture of you baking is stunning! !